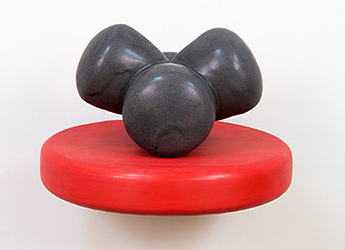 Jeff Krueger, "Black Fours on Red Shelf: Butterfly," 2019, midrange ceramics on enameled poplar wall shelf, 9 1/2 x 14 x 13"
Jeff Krueger and Terri Rolland both work with clay, but in very different ways. They work out of New Mexico, and the work of each highlights shape and form, but they have found their own unique ways of interpreting their medium. Krueger creates mostly glazed, medium fired ceramic sculptures that recall familiar domestic objects, but are also biomorphic. Many of his sculptures are composed of soft, rounded forms that look like organic elements from another world. Others take unique, abstracted shapes that resemble familiar objects, like childhood toys or kitchen utensils. His “Milk Drop” pieces recall exactly that, their high-gloss surface possessing a sensuous form and surface. Rolland’s unique paintings combine acrylic and clay paint. This unconventional painting medium creates flatness in the work that, combined with the textural elements She imprints in the clay paint, creates an enticing surface that resembles the adobe architecture found so prevalently in New Mexico. Like Krueger, Rolland creates abstracted forms with soft, rounded lines and shapes, and uses rich blues, yellows and browns which are slightly muted from the clay’s flatness. It works well against the highly glossy soft pastels and browns of Krueger’s sculptures. Rolland lends them an impression of natural forms and geographical elements. While the two artists are distinctive in their interpretation and use of clay, these differences work exceedingly well together, resulting in a harmonious exhibition.